Built by James Stokes in the early 1840s. Scene of many dramatic incidents in the late Mexican and early American periods. When we photographed the Stokes adobe, it housed Restaurant 1833. 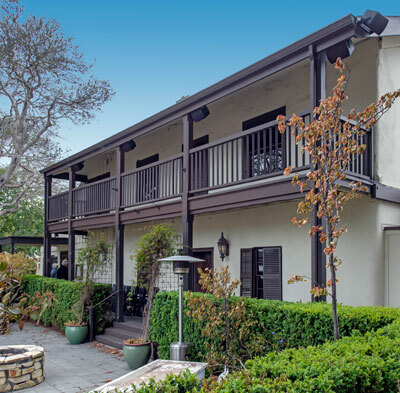 According to the Restaurant 1833 website,	the Stokes Adobe was built in 1833 for Ambrose Tomlinson as a single room. Tomlinson sold the building to James Stokes, a British sailor who jumped ship in 1833 with cases of medicine. As "Dr. Stokes,"" he opened a pharmacy. Stokes became the physician of Gov. José Figuero who died in 1835. Many of Stokes' other patients also died, but Stokes prospered and married the widow of one of his patients. In 1844, he added seven rooms and a second floor to the adobe to accommodate his wife and six children, four of whom had been fathered by his wife's first husband.